Do you remember that guy who Facebook Live-d his wife giving birth, hastening the arrival of an era where literally everything is fair game for public consumption? It turns out he had no idea what he was doing! Kali Kanongata’a, the 36-year-old videographer, said he thought he was filming his wife, Sarah Dome, give birth to send to a few family members who lived far away. 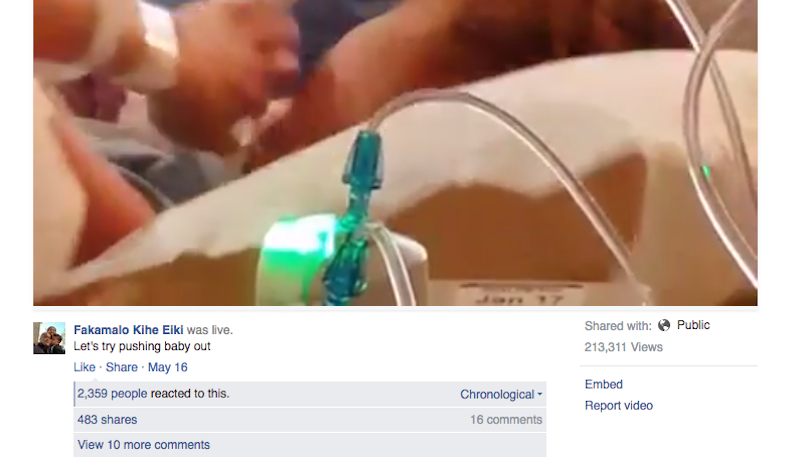 When one of his cousins commented on the live stream, “Keep pushing,” he had to double check what was happening. Kanongata’a says that when he noticed the number of viewers was in the thousands he considered stopping the recording “for a second” and then decided he would be happy to share his family’ s joy with the world. The 44-minute video, which is still available on Facebook, has been viewed 211,947 times, “reacted to” 2,342 times, and shared 478 times. Apparently, Dome, a more forgiving woman than I, is fine with her husband’s decision to push forward.